Right behind flavor, a drink's presentation can make or break it. You can do all sorts of things to dress up a cocktail, but few can beat the impressive look of one with layered ingredients. These stunning drinks are colorful, vibrant and can impress anyone. The trick is learning how to float ingredients on top of one another. We're going to explore some of our favorite layered cocktail recipes, but don't stop with these. Once you understand how the specific gravity of liquids works and develop the technique, you can layer drinks to your heart's content. It's really quite straightforward. It may surprise you that beer is one of the easiest liquids to layer. The trick is to choose the right styles of beer. Typically, a light beer is poured first, then a darker one (such as Guinness Stout) is floated on top. 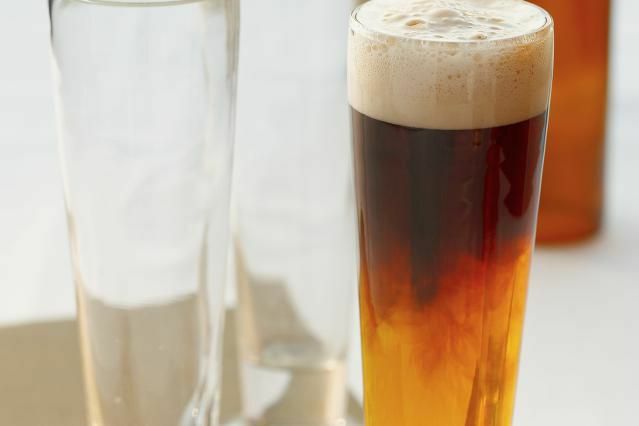 Drinks like the Black and Blue and the Black and Tan are easy pours and among the first drinks bartenders in any establishment learn to make. Most bars even have a spoon attached to the taps for this exact purpose. The Easter bunny is a fun mixed drink that is also a snap to pour. 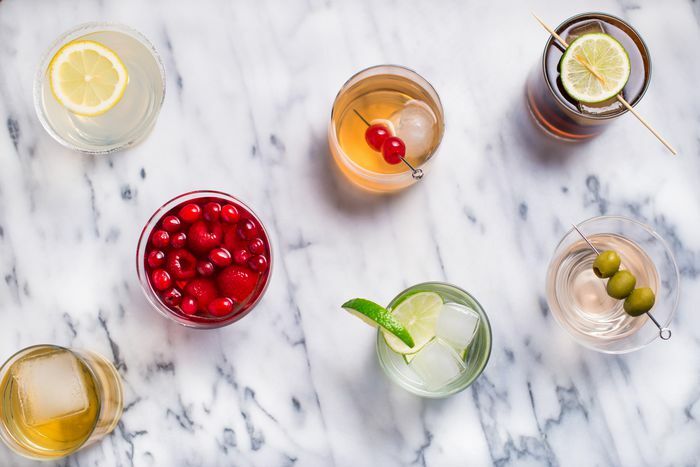 It's perfect practice for your cocktail layering skills and it tastes delicious. For this recipe, you will shake crème de cacao and vodka, then strain them over ice. It has a double float of chocolate syrup and cherry brandy, which rest perfectly on top and give the cocktail great visual appeal. Much like the milk in the lattes from your local coffee shop, a real cream is almost always guaranteed to float. It is the signature of a genuine Irish coffee and a finishing touch that should not be overlooked. In this classic cocktail, the blackest coffee you can create is sweetened with brown sugar and spiked with Irish whiskey. The brew is then topped with freshly whipped double cream, which becomes a luscious barrier to the coffee underneath. Another example of the cream float in action comes in the very popular vodka cocktail we know as the White Russian. If this is one of your favorite mixed drinks, spruce it up next time with this smooth floating trick. This drink has a base of vodka and coffee liqueur (typically Kahlua is poured). Though most people mix the cream right into the drink, you can turn the ordinary into an extraordinary drink by floating it instead. A fun and extremely uncomplicated cocktail, the Harvey Wallbanger is little more than a Screwdriver dressed up with a liqueur float. It is another terrific drink for beginners who are interested in perfecting their pour. The vodka and orange juice of this retro drink form the perfect base for a lighter spirit. In this case, you'll float the golden-vanilla and anise-flavored liquor Galliano. It's painless to create and the extra hint of flavor makes a world of difference. Another practical use for layering liquors is when you want to set your drink on fire. The trick is to use a distilled spirit with a very high alcohol content, because your average 80-proof liquor will not burn easily. In almost every flaming drink, a high-proof rum is used to pull off this show-stopping bar trick. At 151-proof, the alcohol has the firepower required, as we see in the interesting Goblet of Fire recipe. Just be sure to blow out the flame before drinking. For other drinks, a dark rum is used to create a layer of flavor and give the drink an upgraded look. It's rather common in tiki cocktails and an option you'll find in many Mai Tai recipes. This tropical classic has been made many different ways over the decades. 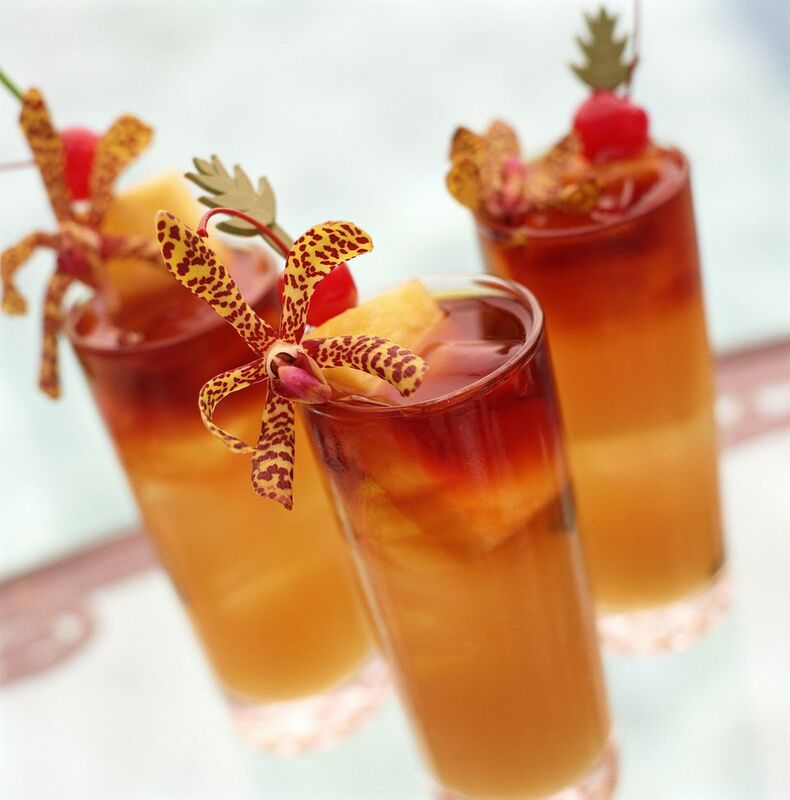 It's best described as a double-rum drink that is heavy on the fruits, though some versions are not as juicy as others. No matter which you choose, you can always finish it off with the dark rum float. It's interesting to note that you can even float a soda on top of a cocktail. It will integrate into the rest of the drink sooner than other liquids, but that sparkling layer is very interesting while it lasts. The spicy paloma recipe is a perfect example of this. It transforms the popular paloma cocktail into a most interesting mix with a great tequila, chili-infused Aperol, and grapefruit juice. The club soda float is a nice touch for this intriguing dinner-worthy drink. Typically, sangria recipes are all about the wine. It is, after all, the main ingredient. But it doesn't have to be that way. In this Brazilian Sangria recipe, the red wine is floated atop a fascinating array of flavors. The drink begins with the most exotic fruit you can find in season. To that, you will add cachaça, Spanish brandy, orange liqueur and absinthe. This is definitely not your average sangria! Another point to layering cocktails is to enjoy the drink as it changes. This Vertigo recipe is proof of why this technique works so well. The first taste you get will be different than the last, and that's what makes it so fascinating! For this recipe, you will mix ginger ale and lemon juice over ice. Top that with ​the digestif Averna. At first, you get the full taste of Averna, and then as time passes it will meld into the sweet-tart soda to become a most refreshing after dinner drink.